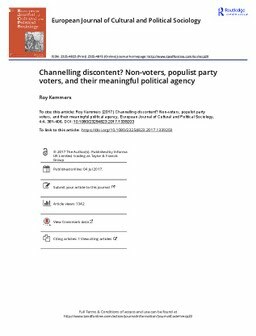 This article assesses the assumption that populist parties form an efficacious exhaust valve for voters, the channelling discontent thesis, as it is termed here. Drawing on in-depth interviews with Dutch PVV voters and (deliberate) non-voters, I assess this thesis in a comparison between them. This analysis shows that non-voters do not lack political fulfilment on two of the three dimensions of efficacy I distinguish. On the third, it is not electoral participation, but respondents’ perceptions of the locus of political power that explains differences in what I term ‘meaningful’ political agency. This inductively generated power-orientation theory contextualises the channelling discontent thesis, demonstrating that it only effectively applies to those citizens who share the definition of the situation the thesis assumes. I argue that these findings highlight an institutional blind spot in the study of populism and political discontents, and make a case for a cultural-sociological perspective.